After many tests to try and figure out how to use flight simulator 2004 without the program crashing on finals I think I found a way. FS9 is not compatible with Win 7 and I just could not use it when I never knew if it would crash or not so measures had to be taken. I found a old computer and did a new install of Win XP and FS9. I installed the same add on scenery and my fav Flight1 ATR-72 500. A complicated plane for any computer to run. But it works in XP and not Win 7. I can still crash the FS software if I open and close a lot of windows. Suspect memory leak somewhere. If I keep to the 3D cockpit and open the windows I need once it is really good. I have made many flights now and no crashes. But I wanted to use my Win 7 machine to so I bought Wideview again. I used to have a license but I have no idea where it is. It is a great piece of software. I use it to run a second copy of FS9 on my work machine. It makes FS9 run in slew mode and that do not crash the software. So here I have two side views. Great for taxi and looking out when flying. I cant see other VATSIM traffic on the side views. For that I have to use FSX I suspect and I have to buy a second copy of it. 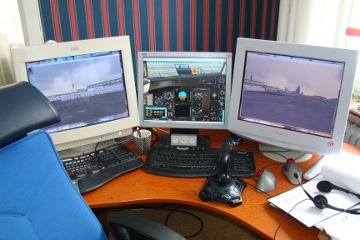 That will be my next project as soon as I get my wings on VATSIM. You are here: Home Simulation Final setup. Many flights no software crashes.